John Alexander is the possessor of pleasantly warm vocals but with a nice raw edge that is perfectly suited to the excellent songwriting of a man who is also a far better than average guitarist! The guitars are always melodic, with the occasional 'jangle' and the arrangements are sparse and perfectly suited to these eleven beautifully conceived and performed songs that fit well under the blues banner, perhaps easing into a folksy, edgy country on occasions. The incredibly loose generic field that he works in is not given to producing albums with huge slabs of originality but when considering the full package of this album there is a loose originality in much the same way as the work of artists such as Peter Case or Michael McDermott. All three impart a strong bluesy feeling in their work but with myriad other influences, sometimes with elements of country and often folksy but always of interest and recognizable, in fact on several songs his vocals remind me of Case and McDermott, perhaps more so the latter. Among his influences are artists such as John Martyn, Greg Brown, Bob Dylan, Muddy Waters and no doubt many others. That is a claim that anyone who hears him will understand and it is those diverse influences that have helped him to construct a completely natural and individual sound and use the height of the bar set by those greats as a benchmark to aim for. If this quality of work continues he is certainly heading in the right direction. Over the last twelve years John has released several e.ps and just two full length albums, the last being 2009s Rain for sale, a recording that had one of its song picked up by the makers of an American t.v documentary about the infamous axe murderer in 'The Lizzie Borden Chronicles.' The Scottish singer songwriter wrote all of these excellent songs himself and played acoustic and electric guitars as well as all lead vocals. Iona MacDonald added her lovely harmony vocals to several of the songs, Paul Tasker played occasional lead and slide guitar, Jim McDermott was on drums, with Nicholas Blythe and Kevin McGuire sharing bass duties. The instrumentation is never over done, with most of the songs having a sparse musicality that allows the depth and the power of the lyrics, along with John's powerful evocation of every story to shine through. 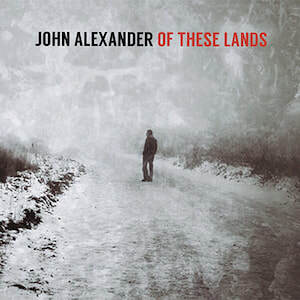 John Alexander's signature lovely melodic guitar sound gets things going on excellent album opener Meet me where the river flows, backed up by thudding percussion and bass with John's easy going vocal style perfectly evoking the lyrics of an excellent song. All my angels have fallen has an atmospheric bluesy guitar sound on a song that is strongly reminiscent of Peter Case at his best. The acoustic and electric guitars combine beautifully to suit John's raw vocal on a deep, intense tale that includes an excellent guitar break. On Take the blame the percussion has a different feel on yet another excellent composition, with the supportive bass gently propelling the song and Johns beautiful melodic guitar adding a powerful colouration to both the story and his evocative vocals. Seven cold curses is a spooky blues, with a restrained acoustic guitar and haunting electric guitar throughout. There is no bass or percussion but there are some haunting harmonies from Iona MacDonald on another tremendous song and performance. Within these songs and despite the sparseness there are great variations, seemingly in the instrumentation, after all bass, percussion and even harmony vocals are sparingly used, but as the listener gets used to the album it becomes apparent that it is the textures and moods that help create those quite distinct variations, all this despite the recording barely even reaching mid tempo. It requires great talent to achieve that, something this artist has an abundance of. Whilst comparisons are pretty meaningless, they can at least give the potential listener some idea of what they will hear. On this album those comparisons I've made to the esteemed Case and McDermott are loose and apply more in terms of quality and the natural flowing storyteller style and yet the more I listen to this recording the more accurate I feel those comparisons to be. I'm pretty sure many people will, or have, picked up on this and ultimately to be even loosely compared to those two should give some idea of the extreme quality that those who purchase this tremendous album will bear witness to.